For a heartfelt gift they'll treasure forever, this sterling silver pendant is the perfect choice. 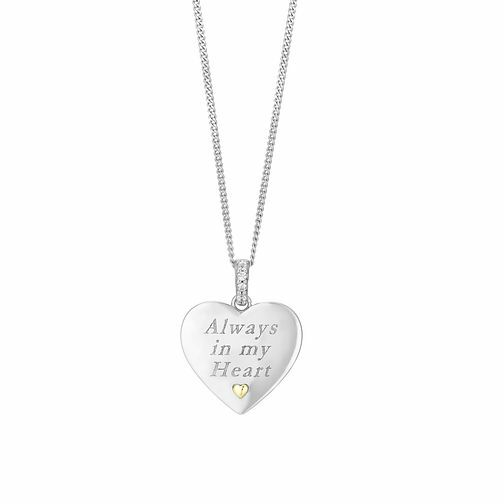 Set on a fine 18" chain, this pretty heart shaped pendant features the words Always in my Heart on the front, and is finished with a 9ct yellow gold heart detailing and shimmering cubic zirconias on the bail. Silver & 9ct Gold Cubic Zirconia Always in My Heart Pendant is rated 5.0 out of 5 by 5. Rated 5 out of 5 by Anonymous from A perfect gift. A gift for my Daughter who was going on her travels, was a little concerned about the delivery time though, and only received it 2 hours before we left for the airport! She loves it and the words are just perfect! Rated 5 out of 5 by Anonymous from Had wedding ring resized Staff were friendly and professional and although I got my ring back a week after they said I would I was kept informed of the progress throughout and was very happy with the result.